Ankle tendonitis is an inflammatory condition that often effects active and flat-footed individuals. 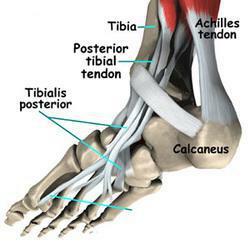 Ankle tendonitis affects the posterior tibialis tendon. The posterior tibialis tendon runs underneath the "bony knob" in your ankle (see diagram below). The role of this tendon is to raise the arch of the foot. Ankle tendonitis should not be confused with achilles tendonitis as they affect different tendons. Ankle tendonitis is caused by excess stress being placed on the posterior tibialis tendon. Those most at risk of developing the condition are people involved in sports that involve a lot of stopping, starting and sharp movements and those that are not properly conditioned to physical exercise. Sports like basketball, squash, baseball, tennis, and football put a lot of strain on the ankles. Individuals who are just beginning a new exercise program often develop ankle tendonitis. The tendons around the ankle are not conditioned for exercise and inflammation can easily occur. For steps, you should take to prevent ankle tendonitis see the treatment section below.